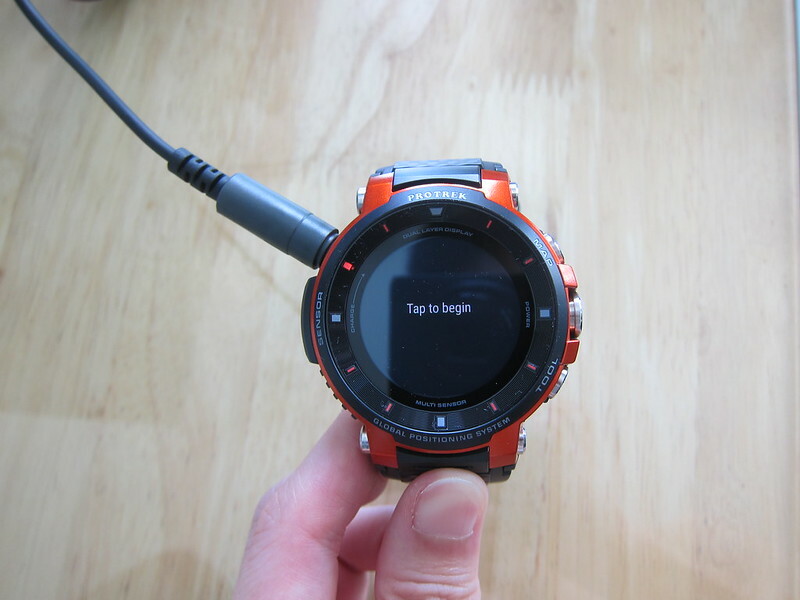 Casio Pro Trek Smart Outdoor Smartwatch WSD-F30  or just Casio WSD-F30, in short, is an outdoor smartwatch running on Wear OS. 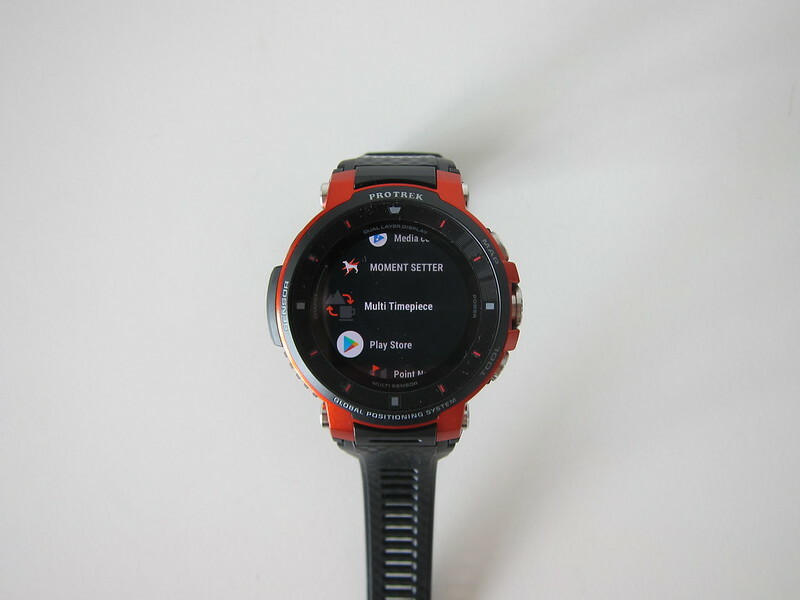 Wear OS is Google’s Android operating system designed for smartwatches and other wearables. 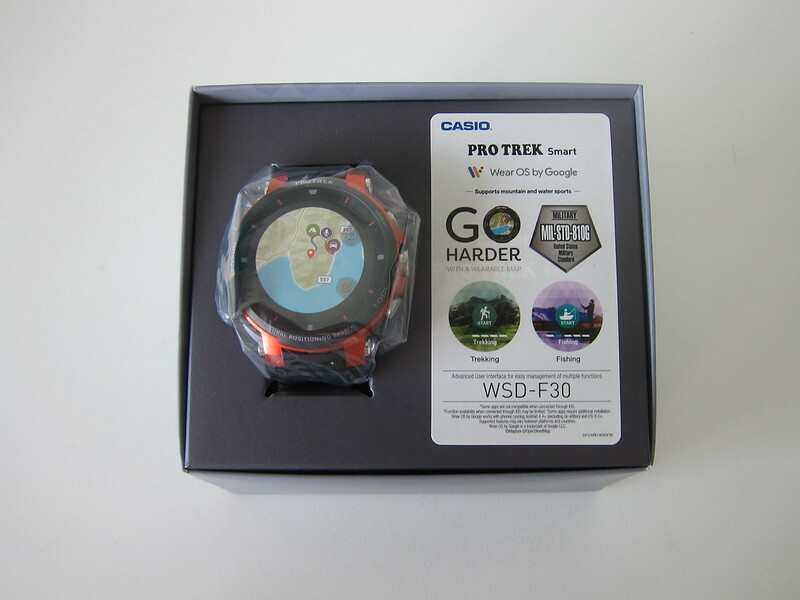 WSD-F30 is the third generation of Pro Trek outdoor smartwatches. The first being WSD-F10  and followed by WSD-F20  the year after. 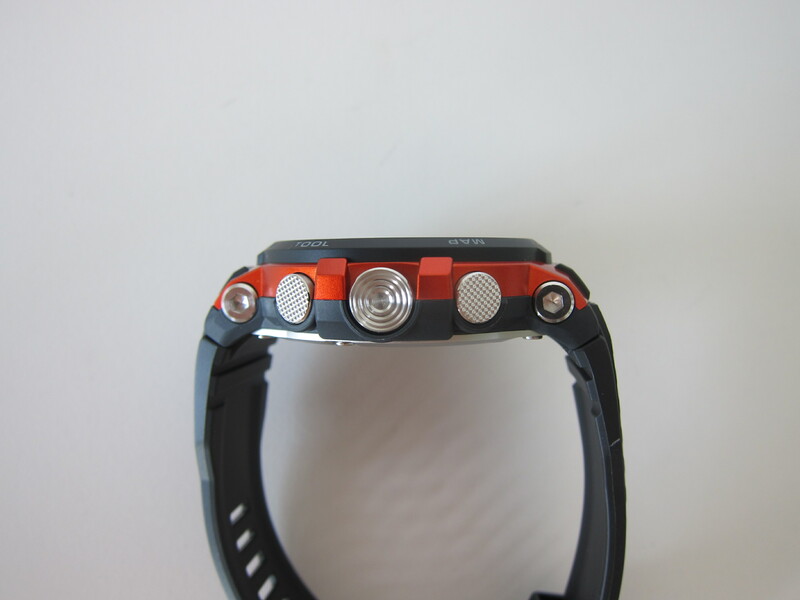 Three colors are available for the WSD-F30, Orange, Blue, and Black. Orange being their flagship color. It was launched in Singapore on 18th January 2019, and it retails for S$749. 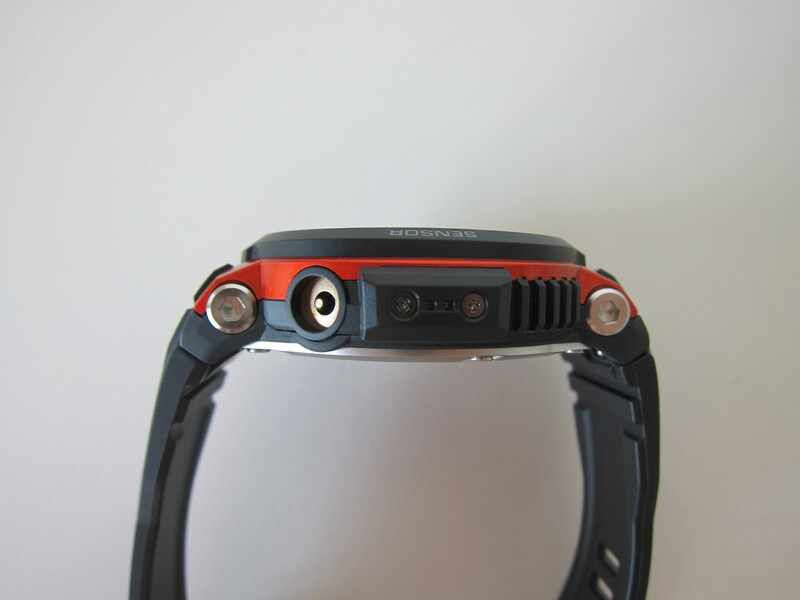 Unlike most smartwatches that uses induction charging, WSD-F30 uses a charging cable to plug to the watch. The charging port located on the left of the watch is magnetic, so it will snap into place. 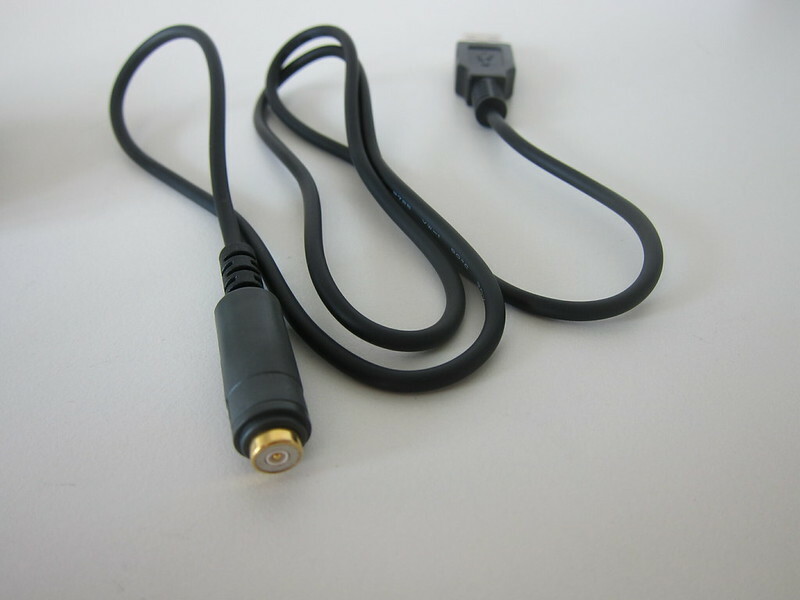 Despite being small in size, the USB charger has to be connected to a bulkier power cord to work. 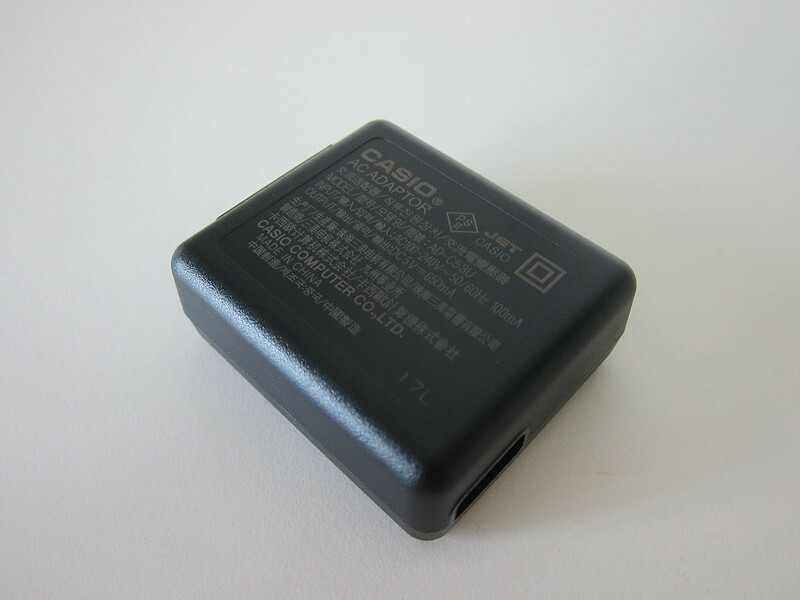 Casio should have just included a USB wall charger instead. I am not a fan of the WSD-F30 charging method. 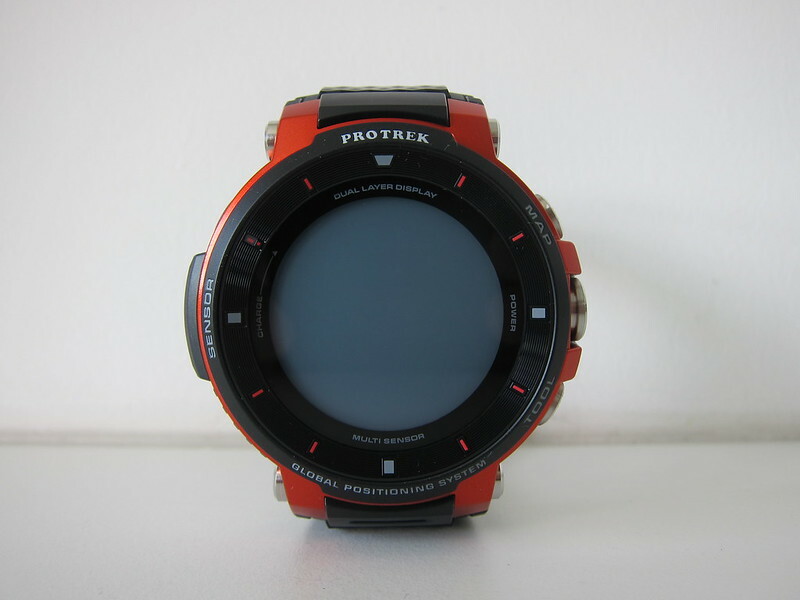 It looks ugly and because of its protruding nature, you will accidentally knock the charging cable off from the watch. The magnet is not very strong. 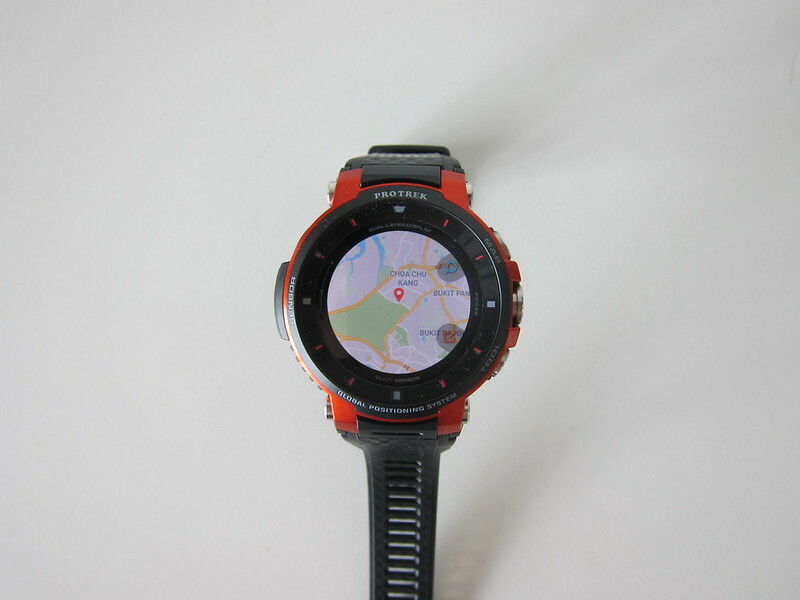 If you are only using monochrome display without GPS, Wi-Fi, or Bluetooth, it can last you about a month. A mixture of both color and monochrome (default), without Wi-Fi or Bluetooth, can last you about three days. This mode is useful for three days/two nights tracking. And lastly, with color and all the features turn on, it will last you about 1.5 days. There are three buttons on the watch and all of them are located on the right. The top button is the Map button. Pressing it shows where you are right now. The middle button is Wear OS power/home button, so pressing it will launch the app drawer. The bottom button is the Tool button. Pressing it will display the information you need for your outdoor activities. The magnetic charging port is on the left. 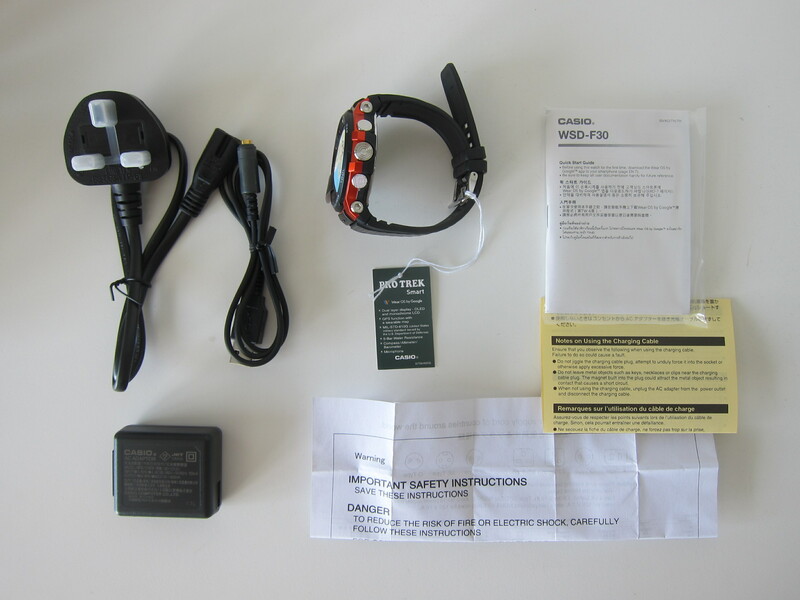 WSD-F30 is designed for extreme sports, and hence it conforms to the MIL-STD-810G  standard for durability established by the U.S. Department of Defence. 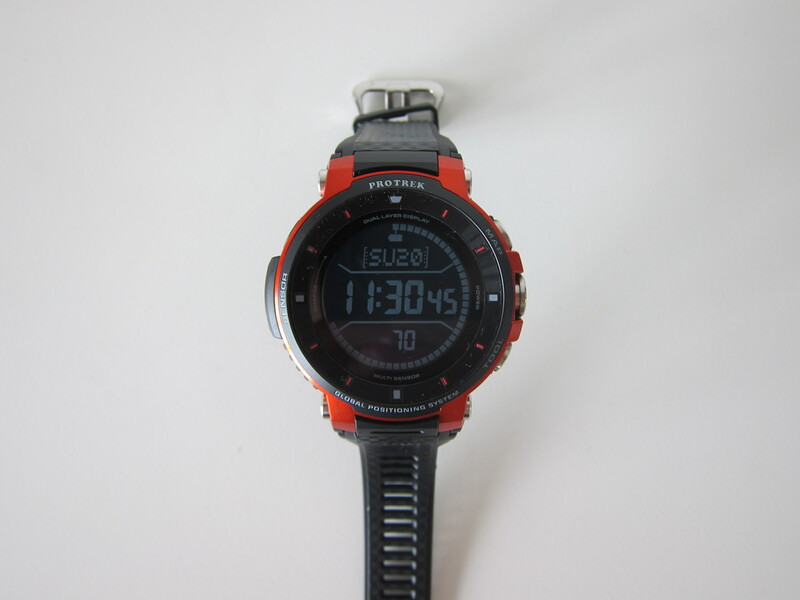 Water resistance of the WSD-F30 is up to 50m. So you can swim with it or go snorkeling with it, but you can’t Scuba dive with it. One of the unique features of the WSD-F30 is the 1.2″ dual-layer display. It has both a monochrome and a color display. For color, it uses an organic Electroluminescent (EL) display which has a higher resolution (390 x 390) than its predecessor. 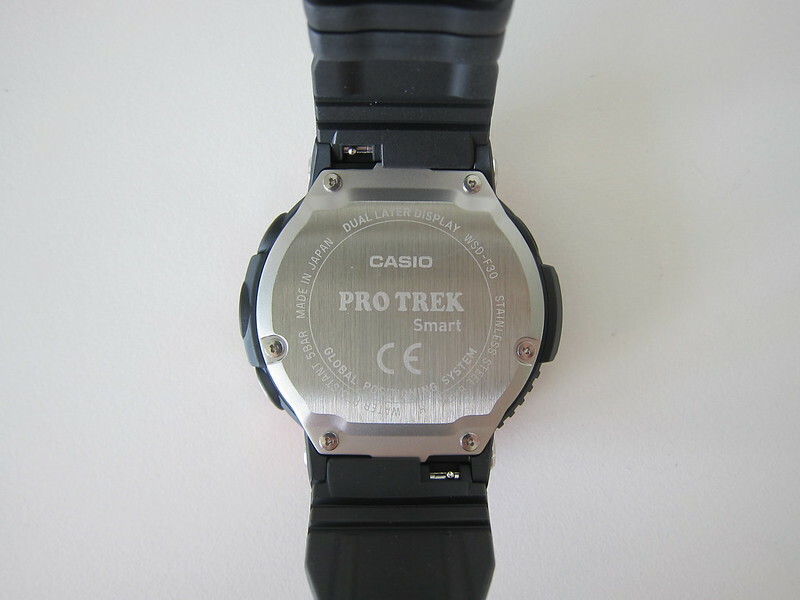 For monochrome, besides the time, it also displays the atmospheric pressure/altitude and compass bearing. 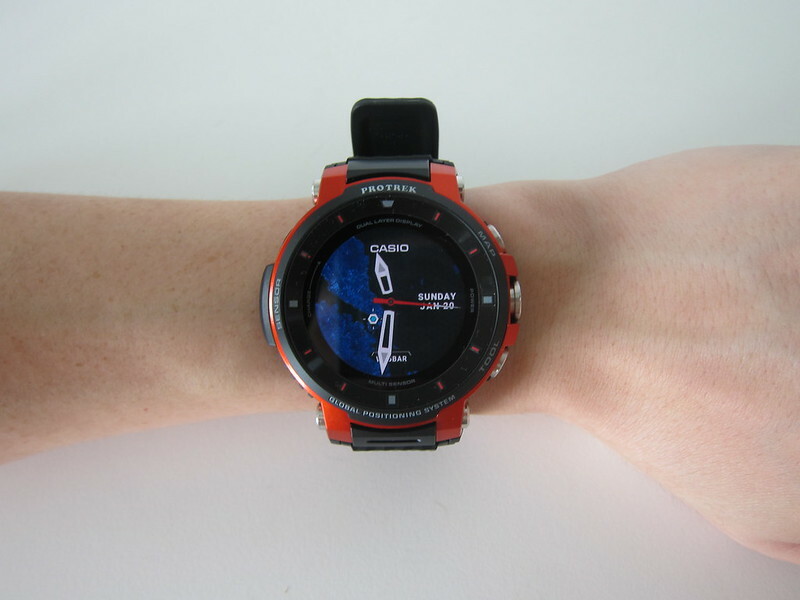 WSD-F30 comes with four original Casio apps. 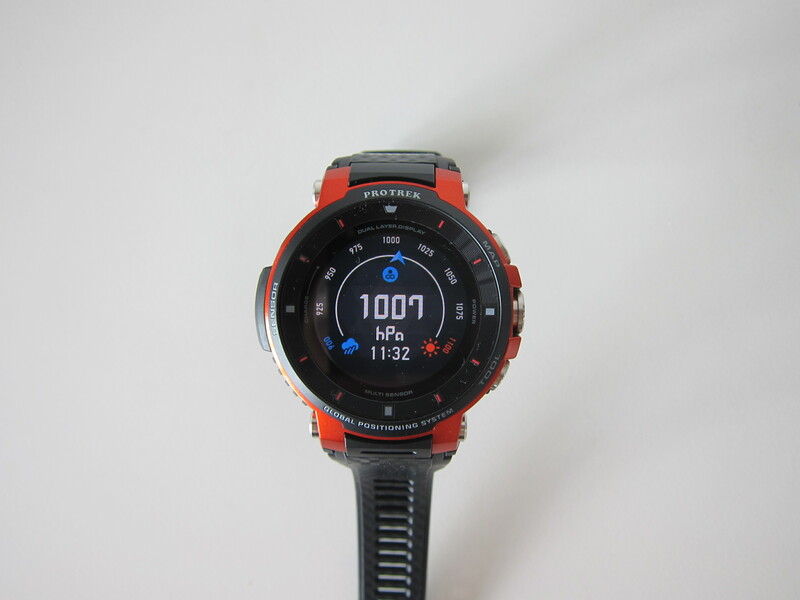 Activity: Display information in real time, from your map and your travel route to data such as speed, distance, altitude, and air pressure changes. The monochrome LCD screen displays some of the data from sensor readings. Tool: By pressing the TOOL button, the app will launch and display the information you need for your outdoor activities. Moment Setter : Set up conditions in advance to receive notifications about the information you need while your activities are being tracked. 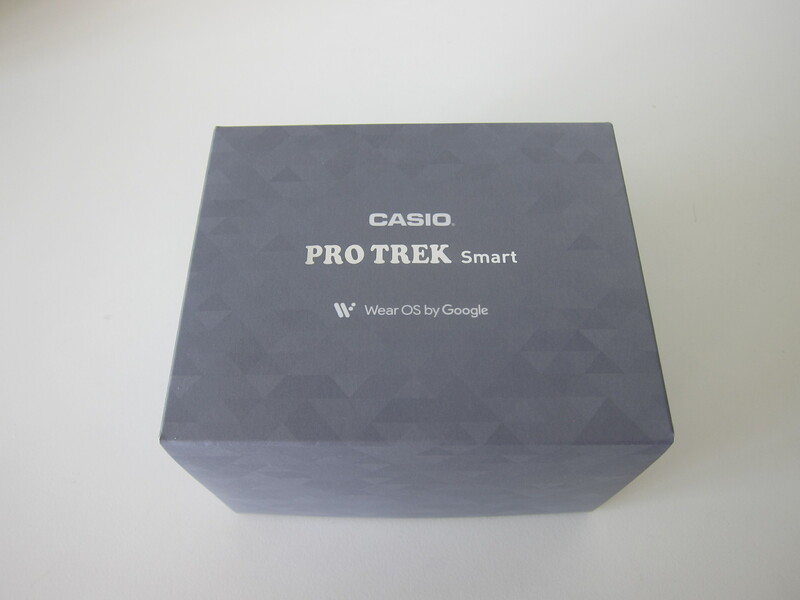 For other apps, Casio’s partners’ design most of the Wear OS apps for Pro Trek smartwatches . 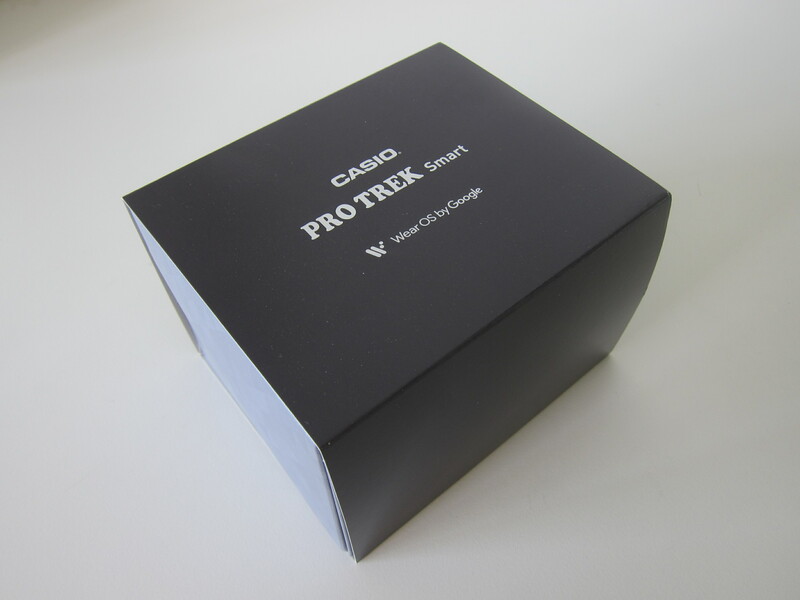 The apps are not exclusive, just that they are designed for Pro Trek smartwatches in mind with the use of the watch’s dedicated buttons. ViewRanger : This GPS mountain-climbing and trekking app allows users to check route guides, maps, navigation, and their progress. Users can plot waypoints to create their own original courses. Bikemap : This app contains map data for over 3.4 million biking routes in 80 countries around the world. Ski Tracks : Ski Tracks is used for winter sports where users can record their activities on the ski slope. Fishbrain : Check fishing spots worldwide, and share photos and data about sizes of fish caught and the locations where fish were caught with other fishing enthusiasts. Hole19 : This global golfing app covers over 42,000 golf courses in 185 world countries. Use GPS to check your current location on the course and calculate your remaining distance. Glassy Surf Report | Forecast : Check wave predictions and weather data for 16,000 surfing spots worldwide. 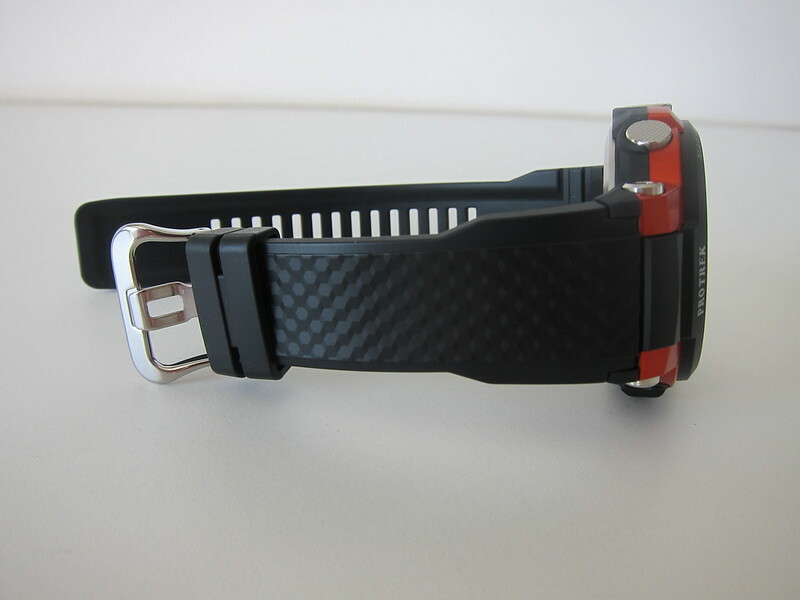 Users can measure and share surfing distance and speed. Equilab : This app can be used to track your training horse-riding training. Register your horse to have the app analyze its movements and turns, track the length of its steps, and measure various other data such as step count, speed, and distance. strokes, lap times, and distances. Zombies, Run! : This app provides a new and unique running experience as you listen to a story unfold from voice recordings. at the gym or at home. MyRadar : This helpful weather information app predicts the weather by displaying an animated depiction of weather changes in the surrounding area. 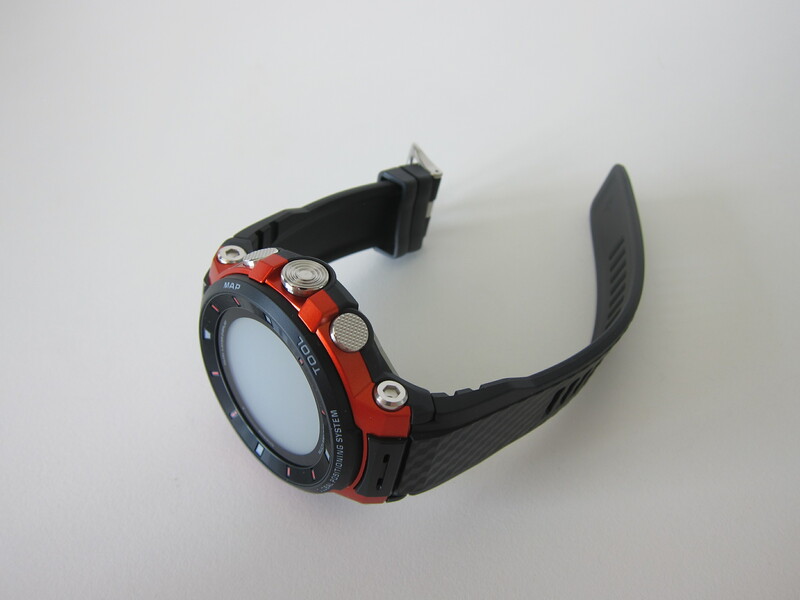 The WSD-F30 is targetted at people who love outdoor and extreme sports due to its shock resistant. I am probably not their target audience since I don’t do both. 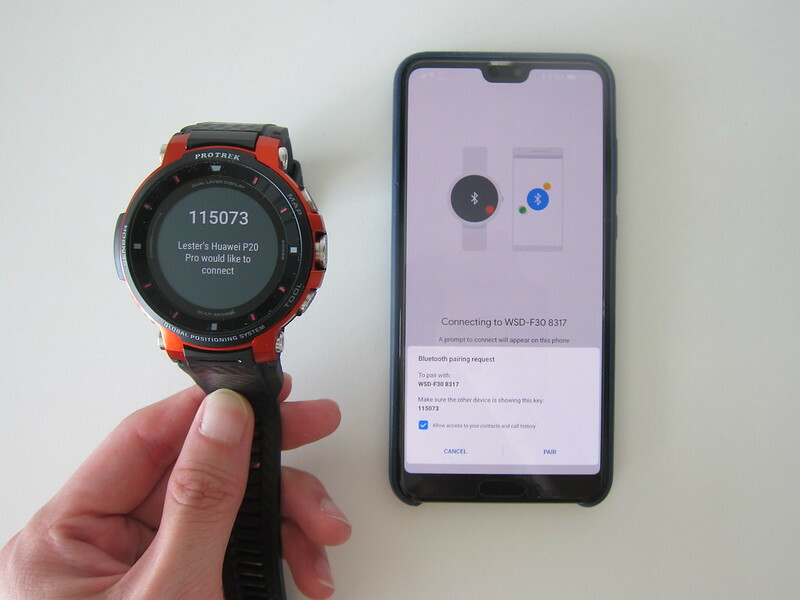 Wear OS does work on iOS devices, but the functionalities are limited. I still recommend user to use Android for Wear OS. If you are on the iOS ecosystem, Apple Watch is probably a better choice. But sadly Apple Watch is not shock resistant. 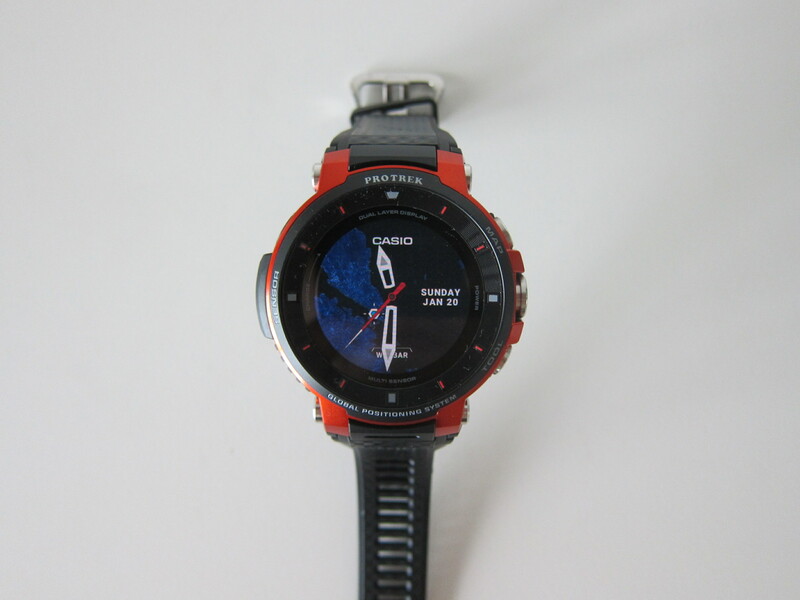 The WSD-F30 is not meant to compete with the Apple Watch but with Garmin’s Fenix 5X  and Suunto’s Traverse Alpha . 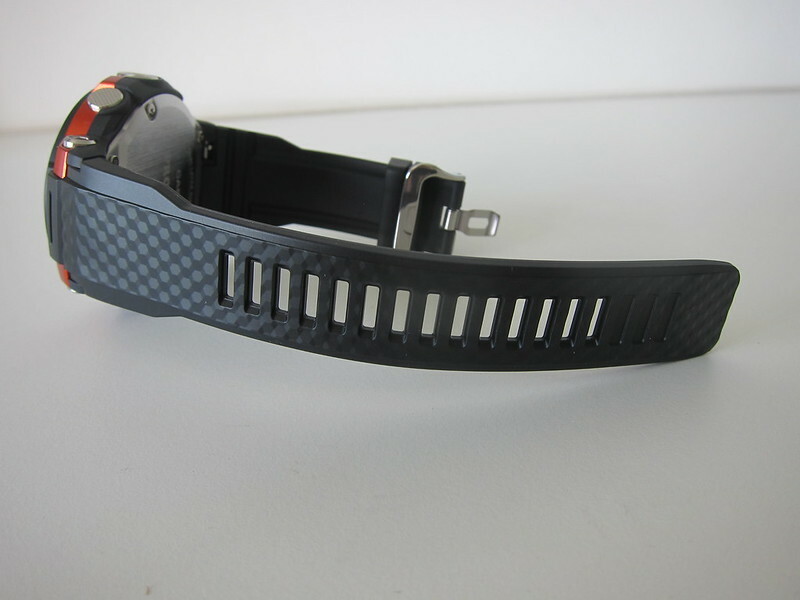 Despite the high price, WSD-F30 doesn’t include a heart rate monitor which is quite disappointing.